Christopher Wood is a contemporary Scottish artist whose works often depict abstract representations of landscapes and scenes in nature. Wood uses bold colors, mixed media, and a diverse array of shapes and textures to convey his phantasmagoric version of reality. 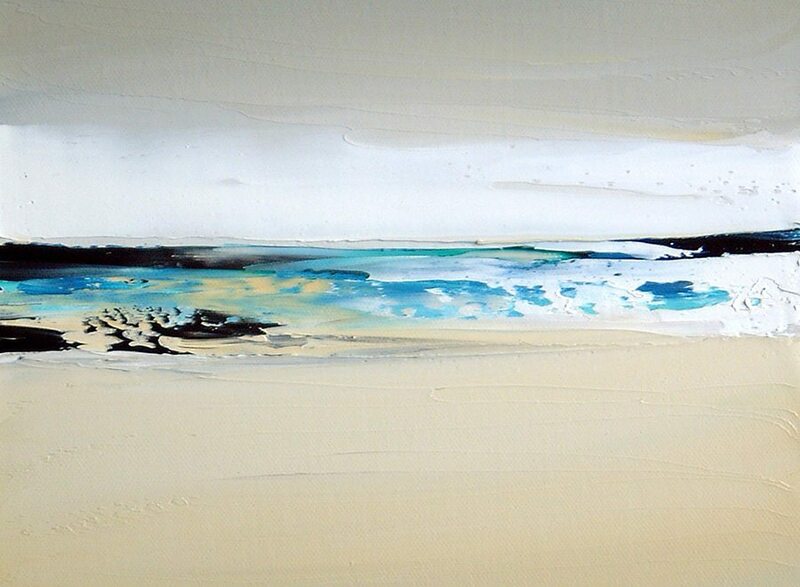 The work above titled “Winter Sea” is evocative of a chilly, serene day by the beach side. The predominance of pastel tones within the painting endows the scenery with a faded luminescence. Broad, sweeping brushstrokes create soft, even planes of sand and sky, the simplicity of the colors minimizing the distraction of the background and drawing the viewer’s eye to the kaleidoscopic texture of the sea. The ashy hue of the sky conjures the imagination of storm clouds hanging low and filling it to the brim; the sand’s unnaturally smooth texture suggests that the ocean tides have lapped upon it thousands of times, perhaps in a recent storm that drove away all the onlookers, save for the viewer. The sea emerges from its monotonous surroundings as a sudden splash of color, a gem shining in the light. The splashes of white in the corner of the painting recall the violent crashing of waves against the shore, the sole source of clamor in the otherwise tranquil scene. Gazing at the waves, which are at once moving eternally and frozen in time, one can feel a salty breeze grazing over one’s cheek, tousling one’s hair, whistling over the flat plane of sand before returning to once again stir the water. Still, the vivid images of reality evoked by this scene do not preclude the possibility of unknown spaces to be filled by our own imagination. What is the black shadow that transverses the ocean? Is it a trick of the light playing upon the water, or is it symbolic of something sinister approaching from the distance? What is the halo of white looming over the ocean? Fluffy clouds, or a dense mist concealing an ominous reality? Who is to say that this is a scene of the beach at all? The painting captures a scene that seems intimately familiar to all its viewers—walking by the beach, cold, smooth sand under bare feet, alone, shrouded in the shadow of the sky, contemplating in the silence broken only by waves—and reminds them of just how much remains unknown, in painting and in reality. Gazing at the waves, which are at once moving eternally and frozen in time, one can feel a salty breeze grazing over one’s cheek, tousling one’s hair, whistling over the flat plane of sand before returning to once again stir the water. An great piece of artwork that leaves the viewers with a feeling tranquility. I see a scene that reminds me of when I was a little girl and woke up early on vacation to take walks along the beach with my father. There is a distinct difference in feelings between a summer sea and a winter sea, and this painting captures it precisely!